Female Namaqua sandgrouse Pterocles namaqua, copyright Johann Grobbelaar. The Pteroclidae, sandgrouse, are pigeon-like birds with long, pointed wings and tails found in arid regions of Eurasia and Africa. Sandgrouse have thick skins and very short legs that are feathered right down to the toes (Austin 1961). 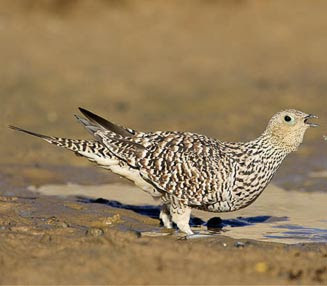 Flocks of sandgrouse can often be found at waterholes, where they often drink after wading into the water. The feathers on their underside absorb water that they carry away for their young.